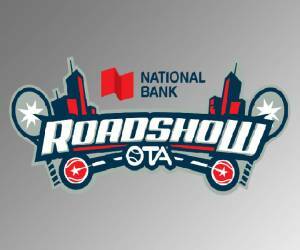 The OTA/NATIONAL BANK ROADSHOW will be touring province-wide at clubs, tournaments, corporate and community events across Ontario. Featuring the OTA Smash Cage, the National Bank "On the Ball" initiative, racquet demos, contests and giveaways; the National Bank Roadshow can enhance your club's tennis event. See below for more information, or contact Marketing Manager, Peter Malcomson.